Help celebrate Female Hockey Day! RED DEER - Registration is now open for Hockey Alberta’s inaugural Female Hockey Day, Saturday, December 15 – with everything happening at the Gary W. Harris Canada Games Centre in Red Deer. The day will feature on and off-ice development sessions for players, coaches, and officials – all to celebrate female hockey. All ages and skill levels are welcome to join. To help us celebrate, and to conclude a full day of Female Hockey Day activities, the Calgary Inferno will host the Toronto Furies in a Canadian Women’s Hockey League game. Player Development sessions are ongoing throughout Female Hockey Day, including on and off-ice instruction for current female players at all levels, from Intro to Hockey (Initiation and Novice) to Midget. Player Development sessions have a registration fee of $15 per participant, which includes a ticket to the Inferno/Furies game. In conjunction with the CWHL Game, a Game Day Speaker Series is being hosted for all coaches involved in female hockey, which includes a seminar, a ticket to the Inferno/Furies game, and a de-brief after the game. Registration for the Game Day Speaker Series is $15 per person. Female officials are also invited to take part in Female Hockey Day with a FREE afternoon clinic, that includes classroom and on-ice sessions. Additional tickets for the CWHL game are available for purchase online, or at the door at $15 each (plus GST). Hockey Alberta invites YOU to enter the Experience the Dream contest for a chance to skate with the Calgary Inferno of the Canadian Women’s Hockey League! The Inferno will battle the Toronto Furies during Female Hockey Day on Saturday, December 15 in Red Deer, and one winner will be chosen to join them on ice during the warm-up and National Anthem. To enter, tell us who your female role model is (hockey or non-hockey related) in a paragraph or short essay, outlining why you look up to them. Please also include a photo or drawing of your female role model. The deadline for submissions is Sunday, December 2 at 11:59 p.m. (MT). RED DEER – Hockey Alberta welcomed three new members to the Board of Directors on Saturday at the organization’s 111th Annual General Meeting. Michael Bates of Cochrane, Francois Gagnon of Fort McMurray, and Wilson Gemmill of Grande Prairie were elected as new Directors at Large. A total of six individuals let their names stand for election for three positions. Bates, Gagnon and Gemmill will join current members Terry Engen (Chair), Fran Zinger (Vice Chair), Rob Virgil (Past Chair), Len Samletzki (Finance Director), Brock Harrington and Allan Mowbray (Directors at Large). Prior to the AGM, six individuals, one team, and two minor hockey associations were recognized for their outstanding contributions to hockey in Alberta, as the 2018 Hockey Alberta Awards, sponsored by BFL Canada, were presented. 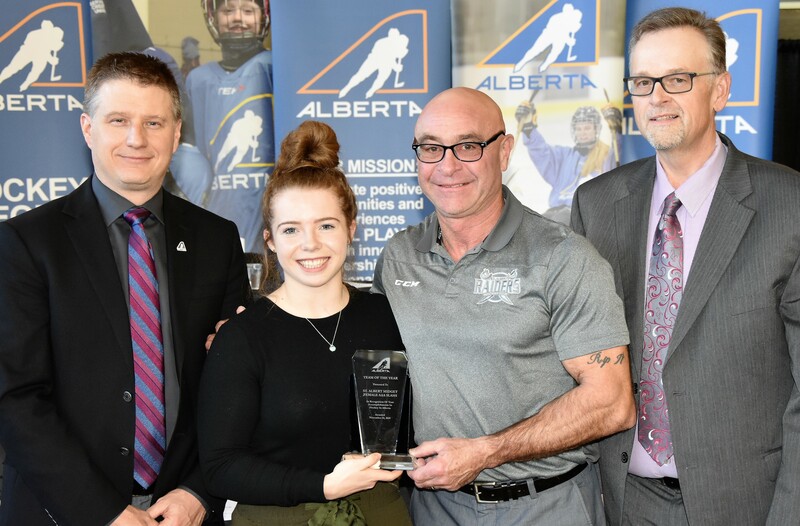 The Hockey Alberta Awards program was restructured this year to include awards that are open to nominations from Hockey Alberta member organization, staff member or volunteer, and others that are determined by Hockey Alberta through a review of eligible candidates. Order of Merit: Debbie Northcott (Caroline) and Brenda Dyck (Edmonton). A maximum of two awards presented to recognize exceptional leadership and distinguished service to amateur hockey in Alberta for 10 years or more. Recipients have dedicated significant effort, time, and leadership to growing and/or developing amateur hockey, not only in their own community, but across the Province. Coach of the Year: Kyle McLaughlin (Canmore). Presented to a coach who has made an outstanding contribution to amateur hockey during the current season. Official of the Year: Chad Huseby (Red Deer). Presented to an official who has made an outstanding contribution to amateur hockey during the current season. Team of the Year: St. Albert Slash Midget Female AAA. Presented to recognize a Team’s significant achievements, performances and contributions within amateur hockey during the current season. Exceptional Provincials Host Site: Whitecourt (Atom A) and Rimbey (Midget C). Presented to the Minor Hockey Association/ Host Committee judged to have implemented the most outstanding Hockey Alberta Provincial Championship during the current season. Ernie Boruk Award: Kumail Moledina (Edmonton). Presented for outstanding dedication and contribution to Hockey Alberta Officials Committee. RED DEER – Hockey is changing, but more importantly, the kids who play it are changing. And these changes have a significant impact on the role of minor hockey coaches and administrators. 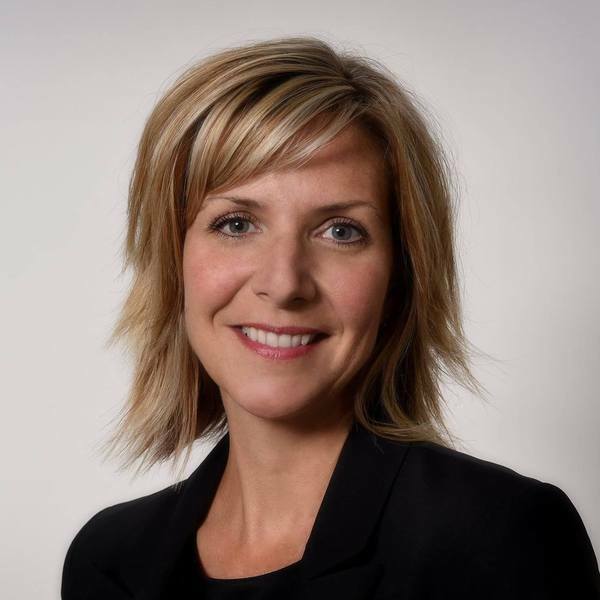 Change, and its impact on the sport of hockey, was one of the themes stressed by Allyson Tufts, in her keynote address Friday night to open the 111th Annual General Meeting weekend for Hockey Alberta. “When you talk about the game changing, you need to remember our youth is changing. So, if you start to see something funny with one of the kids, you don’t need to fix it, but you need to recognize it and tell somebody. It’s important,” said Tufts. Tufts is a hockey mom from eastern Ontario who, in 2015, wrote about her experiences in a book entitled “Lessons from Behind the Glass.” Since then, she has worked with Hockey Canada and BC Hockey, and toured with former CFLer Mike ’Pinball’ Clemons and former NHL goalie Kirk Maclean, talking about creating a better atmosphere for young athletes. In her presentation to more than 100 minor hockey association representatives and Hockey Alberta volunteers, Tufts reminded them of the key role they play in the development of our youth. Tufts reflected on what her son gained from hockey while he was a player - integrity, strength, friendship and resilience. “We didn’t teach him that, hockey did,” Tufts said. And in this digital age of cell phones and social media, the hockey rink has emerged as the new “safe house” for our youth – where the phone is put away, and there is an opportunity for adults to talk and be heard. For more information on Allyson Tufts, go to her website: lessonsfrombehindtheglass.com. The AGM weekend continues on Saturday at Red Deer College. In the morning, minor hockey association executive members will participate in a session with representatives from Hockey Alberta and Hockey Canada. The focus is on building a new national direction, and resetting the focus of hockey in Alberta by building a plan that develops players, grows the game and educates parents. In the afternoon, Hockey Alberta Awards will be presented, followed by the AGM itself starting at 2:30 pm. RED DEER - Hockey Alberta is pleased to present the second installment of the Western Hockey League’s officiating partnership video series. This is an exciting opportunity for all officials to learn from some of the best officials in the country. The link to the first video is included below, and you will receive an email from Hockey Alberta each time that a new video is available for viewing. The videos will be uploaded to Hockey Alberta’s YouTube channel, so you can always access them on your computer, tablet or mobile device. RED DEER - Allyson Tufts, author of Lessons from Behind the Glass, will serve as the keynote speaker on Friday night for the 2018 Hockey Alberta Annual General Meeting. A book designed specifically for parents with a child in organized sports, Lessons from Behind the Glass outlines the ups and downs that come from being a hockey parent, based on Tuft’s first-hand experience as a hockey mom. "If I could go back and do all these things differently, I would’ve," said Tufts in a promotional video for the book. "So, in realizing I couldn’t, I thought the best way to deal with it was to write something to help other people." Since the launch of her book in April 2015, Tufts has seen great success, selling thousands of copies across Canada and the United States. She’s been on an exciting speaking tour, presenting along side Tom Renney, the President of Hockey Canada, Pinball Clemons, CFL football star and motivational speaker and Kirk MacLean former NHL goalie. Allyson continues to spread her message to parents about creating a better atmosphere for our young athletes in whatever sport they choose. Tufts will kick off the 2018 AGM weekend by speaking to the 100-plus delegates from Hockey Alberta’s member organizations from across province about her book, and the lessons stemming from it. MHAs and club teams still have time to sign up for the Hockey Alberta AGM, which runs Friday and Saturday in Red Deer. Registration information and AGM details can be found on hockeyalberta.ca. RED DEER - Parents are integral part of the minor hockey system, and are a key to ensuring that their children have the opportunity to play hockey. Parents have many roles for their children, teams, and teammates. Depending on the day, a parent can be a supporter, advocate, chauffeur, equipment manager, or dietician, making sure that their children can experience and have fun participating in the sport of hockey. Hockey Alberta has a new set of resources designed to support and assist our parents in providing the most positive experience for your young players. Check out the new Parents tab at hockeyalberta.ca. Information available on the Parents tab includes articles from various publications, tips from experts in areas such as nutrition, and updates from Hockey Alberta. Parents are encouraged to check back regularly to see new information as it is added. RED DEER - A reminder to all coaches in Alberta that the deadline to complete all coaching qualifications is Thursday, November 15. Coaches who do not complete their qualifications in time will be deemed ineligible to coach, and will have their team flagged as ineligible for team play. RED DEER – Hockey Alberta is pleased to announce the 2019 Alberta Challenge will be hosted in Leduc. The Leduc Recreation Centre is the host site for the event, set for May 1-5. As noted in the City’s bid, Leduc has successfully hosted a wide variety of provincial and international sporting events, including the 2016 Alberta Summer Games. Regional Camps for the 2019 Alberta Challenge are set for April 5-7 in Fort Saskatchewan (North) and Cochrane (South). Registration for Regional Camps opens in January. RED DEER - Hockey Alberta’s October Coach of the Month, sponsored by Players Bench Team Apparel, is Dan Cavanagh of Calgary. Cavanagh currently coaches three different teams in the Crowfoot Coyotes Minor Hockey Association; Peewee 4 Black, Minor Novice 3 and Jr. Timbits 2. He’s been coaching for 7 years, and is also a Head Coach with Northwest Little League Baseball. "I most enjoy seeing kids develop their skills as players and people," said Cavanagh. "Coaching provides an opportunity to pass on a love for the game. I also enjoy working with the other coaches to help athletes realize their potential. My coaching philosophy is to promote an atmosphere of hard work, respect for others, team play and fun. When we achieve that, success can come in many ways." "Dan is a phenomenal coach who is knowledgeable, level-headed and inclusive," said one of Dan’s fellow coaches, who nominated him for the award. "He coaches or assistant coaches in three different levels of hockey for Crowfoot! I have coached with him for three years and he rarely misses an event. Dan Cavanagh is an asset to the Crowfoot Hockey organization!" Hockey Alberta is pleased to announce Players Bench Team Apparel as the new sponsor of the Coach of the Month Award. November 08, 2018 Help celebrate Female Hockey Day!